Horses possess unique characteristics that help us better understand ourselves and our emotions. Horses are extremely tuned-in to both their environment and the individuals around them. Because of this, horses often respond to our emotions in a way that amplifies them, making them easier for us to understand and acknowledge. Because horses are large, animated animals, it is hard to ignore the feedback they give. They mirror what we feel and how we come across to others, and they respond and give us feedback when we try different ways of being. Horses give us an outside, honest look at who we are—a fact that can be comforting… and sometimes challenging. All of these traits combine to give horses a unique ability to teach us to be more present in the moment and listen to what’s in our hearts. 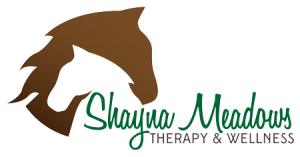 What does an Equine-Assisted Psychotherapy session look like? When we incorporate the horses into therapy sessions, we call it Equine-Assisted Psychotherapy, or EAP. Every EAP session at the farm will be co-facilitated by both a licensed therapist and an Equine Specialist. This team approach allows us to maximize your physical and emotional safety while working with the horses. Depending on your own treatment goals, and whether you are having an individual or group/family session, you may work with one horse, several horses. Duration of individual, couples and family sessions are typically one hour and group work is typically done in ninety minute sessions. The content of your sessions will vary depending upon what you and the therapist design as your personal treatment goals. Then the treatment team will design activities involving the horses which will enhance your self-awareness of feelings, thoughts and behaviors. (explore issues related to self-awareness, confidence, boundary setting, interpersonal skills, trust, respect, body image, etc). 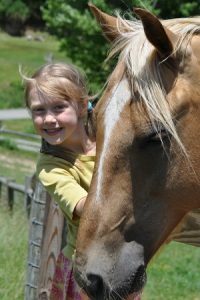 Those activities may include observation, haltering, leading, grooming, riding, and any number of other creative ways that we will guide your interactions with the horses so that you can learn about yourself. Do I need horse experience? What if I am afraid of horses? You do not need any prior experience with horses for EAP to be successful. A sense of wonder and a “beginners mind” is the perfect way to approach EAP. If you have a fear of horses, your treatment team will factor that into your session design in a way that ensures you feel safe.